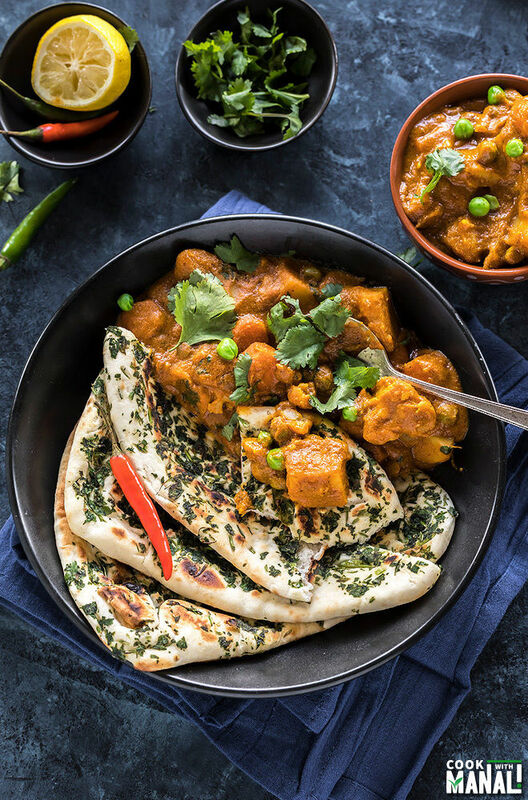 Easy Vegetable Korma made in the Instant Pot – this creamy curry has just the right amount of spice and pairs beautifully with naan or rice. The veggies retain their texture just as they would when cooked on a stove top! Vegan & gluten-free. I often hear people complain that whatever they cook in their Instant pot, it turns mushy and they want recipes with textures. Few veggies I agree easily turn to mush under pressure like broccoli, asparagus but for the rest you can play around with the time/pressure level and get the desired results. 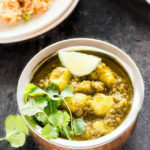 This Instant Pot Vegetable Korma has so much flavor and the best part? It has the perfect texture, like you would cook on a stove-top! Korma is a popular creamy curry originating in the Indian subcontinent. It most often has yogurt, cream or coconut mixed into it. I have a recipe for traditional vegetable korma on the blog but that requires a lot of steps. So after playing around with several alternatives to create an easy recipe, I am finally happy with this! This recipe for vegetable korma comes together really quickly, there are no multiple steps involved and yet tastes amazing. So what do you do to make sure the veggie remain their texture while being pressure cooked in the Instant Pot? How much the veggies get cooked under pressure will depend on 5 important things! amount of water in the instant pot – if you have lot of water in your pot, the pot will take more time to get to pressure > which would result in overcooked/mushy veggies. pressure level – you have 2 options on your instant pot, you can either cook on high pressure or cook on low pressure. This does make a difference to your final result. Veggies like cauliflower are best cooked at low pressure so that they can retain their texture. release of pressure – the final outcome will depend on whether you did a quick release of pressure or let the pressure release naturally. how you dice/chop your veggies – if you chop your veggies like potatoes, cauliflower really small they would turn mushy easily. It’s better to chop them into 1 to 1.5 inch pieces. time – and of course it all depends on the amount of time you cook your veggies for in the Instant Pot! So you have to play along with these 5 things in order to get the best results. It doesn’t come easy, I failed so much in the beginning. But as I tested recipes after recipes for my cookbook, I got an idea about how to get the veggies cooked yet not turn mushy. I for one do not like overcooked veggies at all! I know some people do, but its just not for me. I made this vegetable korma vegan so I skipped on the yogurt which is usually used in korma and used coconut milk only. Let me tell you, this is the like the easiest korma that you can make and it would still taste just as great. To cut short the process, I also used canned tomato puree. You obviously don’t have to do it if you don’t want to. You can very well puree 2 tomatoes and use that in place. 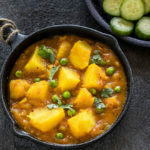 This vegetable korma uses veggies like potato, cauliflower, carrots and green peas. I first cooked the masala and then added the potatoes to the pot. I cooked the potatoes for 3 minutes so that they cook up a bit before I put the instant pot to pressure. Potatoes take most time to cook out of all these veggies so it makes sense to cook them a bit first before pressure cooking. I cooked the remaining veggies at low pressure so that the cauliflower doesn’t turn mushy. The result was perfectly textured veggies! Make sure to cut your potatoes and cauliflower into large pieces. That’s important so that the veggies don’t turn mushy. 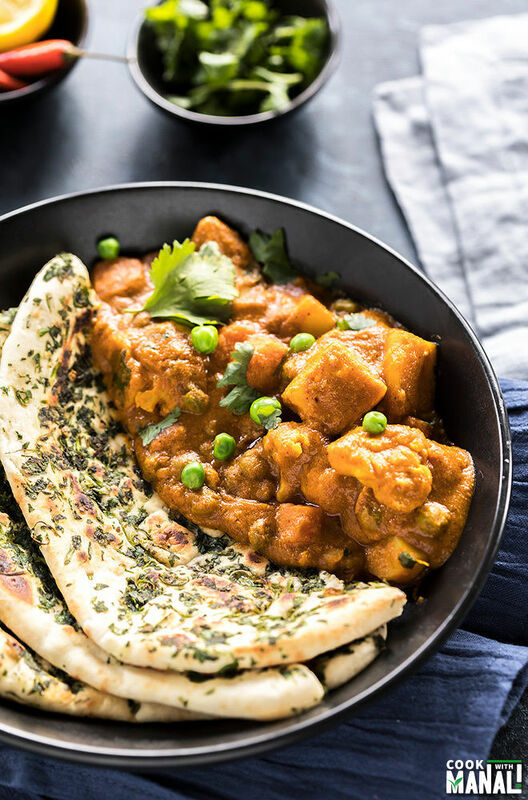 This Instant Pot Vegetable Korma is packed with flavors, the sauce is creamy with just the right amount of spice & perfect texture of veggies! It goes so well with naan or rice. It’s also vegan and gluten-free. 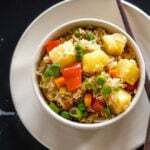 In case you don’t care on the recipe being vegan, you can use ghee in place of oil and even use heavy cream in the recipe in place of coconut milk. Enjoy! To a blender add onions, cashews, ginger and garlic. Grind to a fine paste and set aside. Press the saute button on your Instant Pot, once it displays hot add oil to the pot and then add peppercorns, green cardamoms, whole cloves and bay leaf. Saute for few seconds until the spices are fragrant. Then stir in the prepared onion cashew paste and cook it for 3 to 4 minutes, stirring continuously. Stirring is important else the paste will get stuck to the bottom of the pot. Add the tomato puree, mix and cook for another 2 minutes. Then add in the spices – coriander powder, garam masala, red chili powder, turmeric powder and salt. Stir to combine and then add 1/2 cup of water. Add in the coconut milk, sugar and mix well. Now add the diced potatoes and mix. Cover the pot with a glass lid and let the potatoes cook for 3 minutes. We do this so the potatoes are slightly cooked before we put the pot to pressure. Rest of the veggies don’t take much time to cook but potatoes do so this extra cooking time helps in getting the right texture for all the veggies. After 3 minutes add in the remaining veggies – cauliflower, carrots and green peas. Stir, sprinkle cardamom powder on top and then close the instant pot with its lid. Cook on low pressure for 3 minutes with the pressure valve in the sealing position (the Instant Pot would take 8-10 minutes to come to pressure). Do a quick pressure release. Open the pot, stir the veggies and then add lemon juice and cilantro. 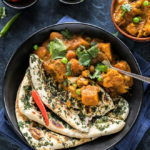 Serve instant pot vegetable korma with naan or rice! 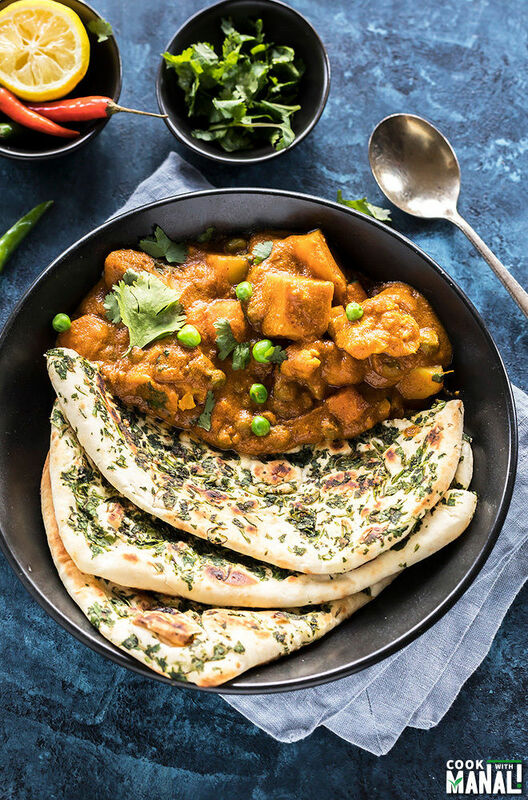 Easy Vegetable Korma made in the Instant Pot! 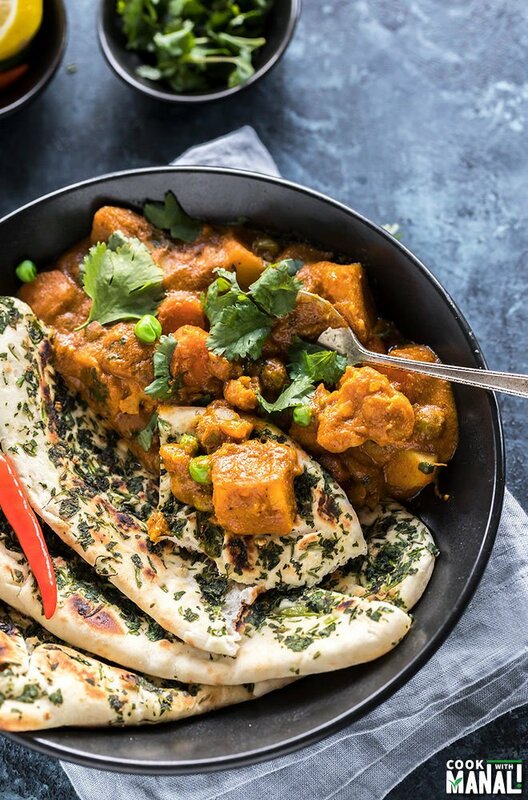 This creamy vegan curry pairs so well with naan or rice. Vegan & gluten-free. To a blender add onions, cashews, ginger and garlic. Grind to a fine paste and set aside. Then add in the spices - coriander powder, garam masala, red chili powder, turmeric powder and salt. Stir to combine and then add 1/2 cup of water. Now add the diced potatoes and mix. Cover the pot with a glass lid and let the potatoes cook for 3 minutes. We do this so the potatoes are slightly cooked before we put the pot to pressure. Rest of the veggies don't take much time to cook but potatoes do so this extra cooking time helps in getting the right texture for all the veggies. After 3 minutes add in the remaining veggies - cauliflower, carrots and green peas. Stir, sprinkle cardamom powder on top and then close the instant pot with its lid. Cook on low pressure for 3 minutes with the pressure valve in the sealing position. 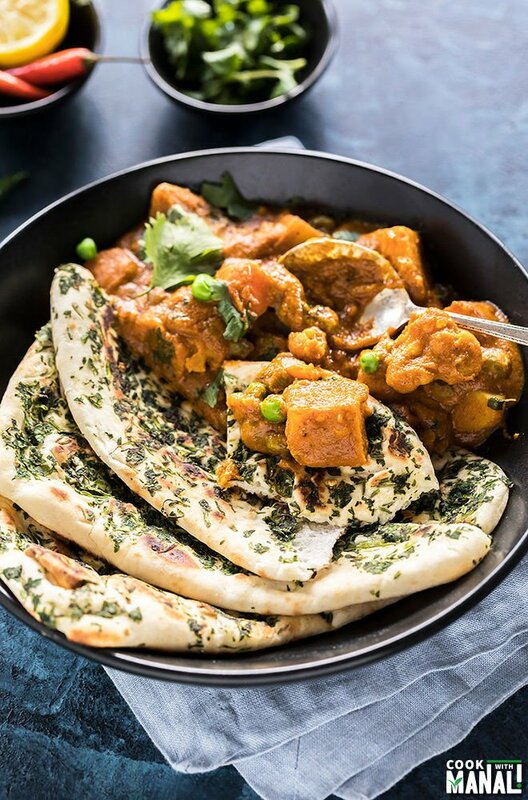 Serve vegetable korma with naan or rice! Preferably use sweet or white onion for this recipe. You may use full fat or lite coconut milk, just make sure you use the one that comes in a can. I have used full fat coconut milk here. 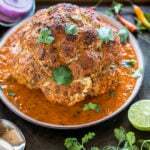 Looks super yummy and comforting with those naan! Looks like such a cozy meal! Love that flavor combo, perfect for dinner! Vegetables do get mushy so quickly in the IP so your tips are great! This meal looks delicious Manali and your veggies look perfect! The flavors are amazing, and the recipe comes together fast, but every single time I have tried to make it (I think I am on four attempts now) it burns like crazy to the bottom before my IP even gets to pressure. Eventually I just give up on pressure cooking it after a few attempts and we just eat mostly cooked veggies. I want to love it, but it is just not working for me. sorry this burn issue is a problem with newer models. this recipe was tested in a 6 qt older model, maybe that’s why this issue. Try adding some more water and add tomato puree at the end and don’t stir after that. Looks super yummy and delish…can I double the recipe as such,? I have ground cardamom and cloves on hand. How much do you suggest I use in place of the whole spices? pinch of ground cloves and 2 generous pinch of cardamom powder towards the end. hope that helps! I replaced the cardamom pods with a teaspoon of ground. Delicious dish! I often ask these replacement questions directly to my browser and find loads of solutions. We just got an IP and we are excited to start our journey with a few of your tempting recipes. Quick question…Do we remove the whole spices from Step 2 at any point, or do they go to the table? no I don’t remove them.. you may if you want to 🙂 Hope you enjoy it! I bought green cardamoms for the first time and wondered what part the number “4” refers to. Do I use the berries of 4 pods or just 4 berries? Hi Cindy, you just add the green cardamoms as such, you may slightly crush them before adding to the oil. 4 means 4 whole green cardamoms (with the skin). hope it helps! Can you make this without cashews? My fiance has a tree nut allergy. Perhaps by replacing the cashews with peanuts? Or just leaving them out entirely? Thank you! This looks delicious. I will just leave them out…peanuts won’t work the same way in terms of flavor.. Thank you! We made the korma last night and it was delicious. We’re looking forward to trying your Tofu Tikka Masala next! Hello. Do u have an e Cookbook or can I print off your korma recipe? I couldn’t find tomato puree, only tomato sauce. Do you think that will be ok to use? what kind of tomato sauce? 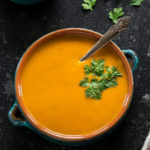 If its like tomato ketchup it won’t work.. tomato sauce is usually pre-seasoned..I am not sure if it will work perfectly well for the flavors but you can give it a try! You can substitute tomato paste for puree by adding water. Just mix 1 tbsp. tomato paste for every cup of water. I managed to find a huge can of tomato puree at Ralph’s. Left out the ground cardamom and cilantro since I didn’t have any. Got the dreaded burn message despite being diligent about stirring. I opened the lid and did some more vigorous stirring then crossed my fingers and fortunately the pot came to pressure on the second attempt. This dish was delicious – the texture was a little grainier than what I would get at an Indian restaurant but the sauce was much more flavorful and had a pleasant heat to it. Texture of the veggies was perfect – soft but not mushy. The biggest downside was it was a lot of prep and a lot of dishes to clean. Despite that I would make it again. Thank you for the recipe! Does this use the same chili powder I use in Mexican cooking (which is red in color), or is there a different kind I should buy? Melissa, I am not sure which chili powder you use in Mexican cooking but if its hot, it should work here as well. 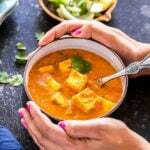 Could you add paneer to the recipe? If so, what step would you recommend? yes sure, just add it once the korma is done. so once you release the pressure,open the lid and then press the saute mode. Add in the paneer and let it simmer for 2-3 minutes and done! Word of caution- the cashew puree even when the tomato sauce is added is very thick and will bubble throwing burning hot thick paste out of the pot. You can’t slow stirring to measure spices so have them premeasured ready to dump in and suggest stirring with a wisk, which i switched to after my flat wood spatula also caused this to jump out of the pot. Got the burn message 4 times in a row, turned off and stored thoroughly every time. Just gave up and dumped it all in a pot hoping it will work on the stovetop. This expensive appliance is not saving me any time! I am sorry you are disappointed.. IP doesn’t quick anything super fast..it’s no magic..takes time to come to pressure..but its way more convenient and allows hands free cooking which for me is very important. Also this burn message thing is a issue with the newer 8 qt models..several people have successfully made this Vegetable Korma recipe and have been very happy with it.. so maybe it’s just your IP?! I also got the burn message 4 times in a row and ended up using the stovetop 🙁 I was using an istapot duo. Maybe the newer instapot models require more water? I had quadrupled the recipe, so that may have also made a difference. This was really frustrating. However, the end result tasted really good. yes I guess their sensor is more sensitive..it’s very frustrating..I make these recipes all time and never get burn message but it’s a problem with the newer models 🙁 sorry you had trouble..
Just ordered your cookbook but I can’t wait until it gets here. I am SUPER happy to have found this site. Thank you for all the wonderful vegetarian options! I can’t wait to try the Korma. It looks GREAT! Just an update. The we followed your recipe to the letter but doubled it in hopes of leftovers and lunches for a few days. I don’t think it’s going to last that long. It was FANTASTIC! Thank you SO much. My husband even came into the kitchen to help. He’s a very picky eater but said your Korma was the best he has had. Now that I have my little masala dabba loaded up with fresh spices and my insta pot, all I need is more recipes like this one. The UPS truck can’t come fast enough. Thanks again! Oh my! This recipe is delish! No mushy veggies (I suspect cuz I had it on low pressure as stated in recipe). Thanks so much, this will definitely go into the regular rotation. I hate mushy veggies in my IP!! texture is so important to me! So glad you liked it Talita! My wife, my daughter, and I, love Indian food, and my wife and daughter are both vegetarian. We recently got an electric pressure cooker (not Instant Pot brand). So I will be trying this recipe tonight, and bookmarking this page on my browser too. Hope you enjoy this recipe Michael! Made this tonight. I was really impressed with how it turned out. My tomatoes weren’t red enough to give the gravy its red color so I added smoked paprika to it for a slight color boost (and smokiness). Veggies were perfect and not mushy at all. 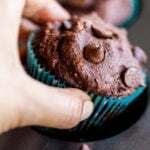 My sister (I’ve had to push her to use her IP) found your recipe and recommended it to me. I’m a seasoned IP user but I hadn’t come across your site before. I’m glad I did now! Looking forward to trying other recipes on your site. This recipe is fantastic! So simple and fast. I used a full can of coconut milk (and 2/3 cup tomato puree) just so I would’t have leftover coconut milk sitting in the fridge that might go to waste. Cooking the potatoes a bit first is a great idea. I think with a smaller dice one could almost skip that step. The green peas are so fast to cook, I add them after opening the pot so they stay bright and green. Toasted some cumin seeds and stirred them into the basmati, and bam, amazing meal. Have made this twice this week already, and it’s definitely staying in our regular rotation. This recipe looks wonderful. My son is allergic to cashews, pistachios and walnuts. Is there something equivalent I could add instead of cashews for the paste ? Or just omit the cashews? Any recommendations for the garam masala spice? I went to the store and was surprised when I looked at two with completely different ingredient lists. I’m hoping you can help. I am really looking forward to this recipe and your others for my daughter who recently decided to be vegetarian. This recipe just… did not work. At least not as an Instant Pot recipe. The smells and flavors are amazing, but despite employing multiple strategies, I was not able to get this to actually pressure cook–it repeatedly kicked into the “Burn” error state no matter what I tried. Eventually I just gave up and put it on the slow cooker setting. Again–smells incredible, I really, really wanted it to work–and I’m glad it apparently did for other people. For me, not so much. Made this with rice and naan so delicious!! Made this tonight and like someone commented, I got the “burn” indicator 3 times before I decided to dump it in another pot and finish on stove top. The onion/ginger/cashew paste is very thick which I think is the culprit. The flavors of this recipe is outstanding. Next time, I plan to parboil potatoes and carrots (maybe even the cauliflower) so that it doesn’t have to cook too long in the instant pot or just cook it on stove top. hmm..yeah burn issue is the problem in the newer models…glad you liked the flavor though..